We were delighted to be awarded ‘highly commended’ (aka Runner Up!) in the wedding video category for the South West Wedding Awards in 2018. We’ve been lucky enough to win in previous years, and exciting as it is to be awarded the little plaques and go up on stage – but that’s not our favourite bit…. Our favourite bit is when we get the full client comments (that were included with every vote) – it makes us a bit teary every year! Sophie left us the most amazing comment! So we’ll be using a few blogs to talk about some of those amazing comments. Honestly, it warms our heart so much to read them – it’s these reactions that are the reason we do what we do. Our lovely brides and grooms put a lot of time aside to write such wonderful things – so we demand the world see them as well! 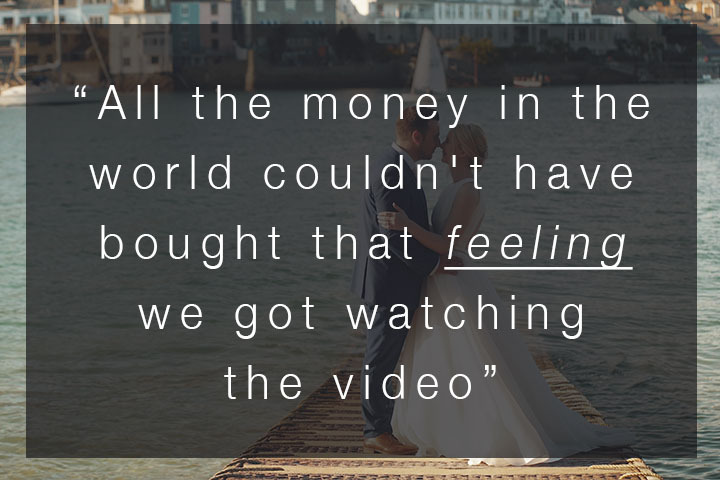 “Wow Wow Wow is all we can say about our wedding video. We knew Chris was going to be good from seeing his previous work but our video surpasses anything we expected. Watching it yesterday we were transported right back to our wedding day; we laughed and cried. Every emotion felt on the day is captured perfectly. The happiness beaming from us and our wedding guests is amazing; we believe that’s because of how comfortable Chris made us. We thought that having our wedding recorded would be a little awkward. It did cross our minds not to have it done because the thought of having someone follow us around all day made us feel uncomfortable. We couldn’t have been more wrong about this… having Chris spend the day with us added to it; he is such a fun and lovely guy. We loved him and so did all our guests. As he became part of the day we were so relaxed and enjoyed it from the moment we woke up to moment we fell asleep, Chris captured us the happiest we have ever seen ourselves. In fact; people have said that they seen smiles on our faces they had never seen before. Now we know that the smile on our faces was partly to do with Chris helping make our vision become a reality. It was incredible living out exactly what we had spoke about with Chris. From the walk through Salcombe village, to catching a wooden boat across the estuary, to enjoying our time on the beach, to capturing our dog Ted, to having our sparkler first dance. Chris helped make it all possible and each element is captured on the video perfectly. All the money in the world couldn’t have bought that feeling we got watching the video. It is something we will treasure forever and we can’t thank Chris enough for it. From the moment we started talking to Chris, right up to receiving the video he was so helpful. Chris answered any questions we had and helped pull together a schedule of the day to ensure that everything we wanted to do could be done and captured; he gave us great advise which meant that our ideas came to life, but in a more organised fashion (we also talked over a backup plan because let’s face it, we had a mid October wedding so the weather could have been absolutely terrible! ).